On average, most water heaters last between 10 and 15 years before they need to be replaced. Once parts inside of the water heater begin to corrode or the water heater experiences a buildup of minerals, it may begin to wear down and need to be replaced. Although this is only a general guideline, and some water heaters may last a longer or shorter period of time, here are some signs that may indicate it is time to replace your water heater. Keep in mind that regularly flushing your water heater can lengthen its lifespan. If you notice any leaking around the water heater, this is more than likely, a sign of internal failure. 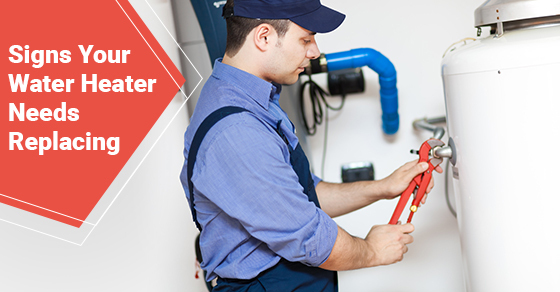 Ensure that you turn off the electricity or gas to the water heater before attempting to replace the water heater. Not having any hot water can be a sign that your water heater has failed and it’s time to replace it. However, a lack of hot water can also signal other problems such as a problematic circuit breaker. While issues with a lack of hot water can usually easily be resolved by adjusting the thermostat, if you have an older water heater (one that is between 10 and 15 years old), it is likely a sign that you need to replace it. If the water coming out of the faucet is rusty, this could be a sign that your water heater is about to break. Similarly, if the water in the tank appears muddy, this too is a sign that your water heater may be close to failing. Lastly, if you can smell or taste a metallic taste coming from your water, this is also a sign that your water heater is about to break down. While the water heater can be expected to make noises as the water heats up, if you notice a popping or cracking sound, this can indicate that mineral deposits have built up on the heating elements inside the water heater. While flushing usually resolves this problem, if you have an older water heater, noise can be a sign that it is time to replace it. If you are in need of a plumber, contact our team of plumbing experts at Brothers Plumbing today. We have over 50 years in the business and a superior track record in the industry. We offer competitive rates, upfront quotes and 7-7-7 service.